Training - Procurement Solutions, Inc.
Procurement Solutions, Inc. offers a variety of training services to our clients, other GSA Schedule holders and businesses that are interested in obtaining GSA Schedules and would like more information on the process. Our trainings show you and your staff how to get the most out of your GSA Schedule. Understanding the GSA process and making preparation to apply, provides pointers on how to maximize your company's products and services and also lays the ground work for GSA Schedule. Assists you to manage your GSA Schedule and maximize your potential. Covers important schedule maintenance issues and GSA Regulatory Compliance. This seminar is a great opportunity to learn more about selling to the government, keeping your existing GSA schedule current, getting new or additional GSA Schedules and 8(a) / Small Business issues. PSI has a partner that joins us from time to time to speak on the SBA 8(a) process and other small business issues. Are you a new GSA Schedule holder? Do you have a GSA Schedule already and just havenâ€™t gotten much use out of it because you arenâ€™t sure how to market it? This training is for you. 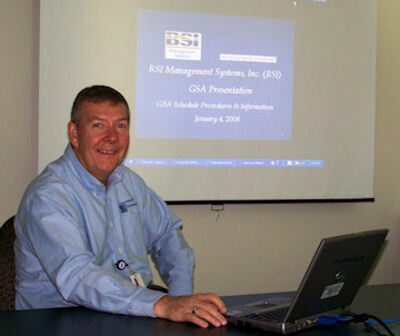 Your GSA Schedule is a â€œtoolâ€� this training teaches you everything you need to know to maximize its potential. We will train you on GSA terminology, required registrations and certifications, websites that you can use to assist you in finding the contracts you qualify for, websites that you can use to track your GSA Schedule sales or a competitorâ€™s GSA Schedule sales, tools to use, Procurement systems available, how your GSA Schedule works, rules and regulations you need to be aware of, RFQâ€™s, pricing standards and much more. Congratulations! You now have your GSA Schedule, so what are you going do with it? This training shows our clients and their staff how to use their new GSA Schedule. PSI will train your company on GSA Schedule information status, approach, required pricelist, Government fees, GSA reporting, GSA programs and any information you need to successfully use your new GSA Schedule. 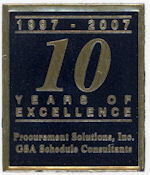 Procurement Solutions, Inc. offers training on other topics including hardware, software, strategic planning and more. Call us today to see how PSI can train you and your staff to get the most out of your GSA Schedule.